I have never been a big breakfast eater. I normally allocate five minutes of my morning routine to either having some oatmeal with fruit or a protein shake. I am constantly in awe at how some can eat eggs, rice, cured meat, bread, jam, coffee and fruit and still call it a regular breakfast. I have tried to eat more at breakfast but it is akin to filling up an already overflowing tank. It is just not possible. Interestingly, though, life teaches us that there are always exceptions, and mine is Dim Sum. Dim Sum traces its origins to ancient teahouses in China. At first, these places only served tea. However, travelers, weary from a long journey, began clamoring for something more substantial to have with their tea. Thus was born Dim Sum. Today, Dim Sum has become a staple at many Chinese restaurants and teahouses around the world. Traditionally, it is served from breakfast time till the afternoon. At present, many establishments have all-day Dim Sum service. Dim Sum is at the top of my all-time favorites list. I can have it for breakfast, lunch, afternoon tea, and, if possible, dinner. I am fortunate enough to visit Hong Kong, China, and Taiwan regularly and I have exasperated many a travel companion as they always hear the same response to the question: “What would you like to eat?” Yes, I will admit it: My name is Sanju and I am a Dim Sum-holic. 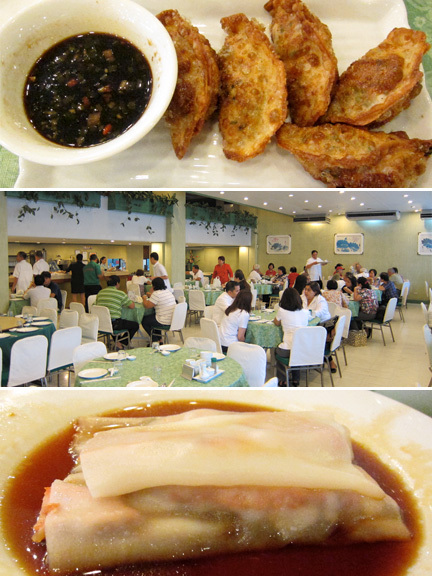 There are many places to have Dim Sum in Manila. There is a myriad of choice from teahouses to Chinese restaurants located in five star hotels. One of my favorite places to have Dim Sum is at Emerald Garden. Established in 1982, Emerald Garden has continued to have a loyal following. They are best known for their seafood and noodle dishes. What many are not aware of is that they also serve Dim Sum for breakfast and at lunch. I personally like the old school, Chinatown vibe of the place, without having to actually make the trek to Chinatown, as Emerald Garden is located along Roxas Boulevard, across the United States Embassy. The food in general may not be as refined as one could have in a hotel restaurant. It is, however, tasty, unpretentious and reasonably priced. I arrived at Emerald Garden early, the Monday after Christmas, to find the place humming with diners–retirees treating themselves after their morning walk at the nearby Rizal Park; professionals, students and even a couple of politicians having a quick breakfast before heading off to work. I had invited a couple of foodie friends who were willing to wake up earlier than usual to join me for my favorite kind of breakfast: The Dim Sum kind. We started out with the Emerald Special Steamed Siopao (P99). 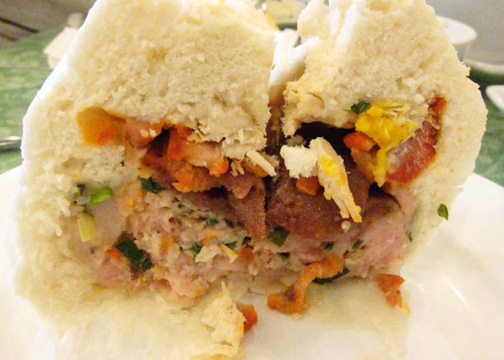 This is a large saucer sized steamed bun filled with honey-cured barbecued pork slices, Chinese sausage, salted duck egg, bola-bola or minced pork, finely chopped chicken pieces and diced veggies. This is served with a dark, sweetish sauce that evokes memories of the 1970’s. Whew! It is quite a lot to take in, but definitely worth it. For some reason, the filling overload melds into a delightful whole that is quite extraordinary. The huge bun does a good job ensconcing everything in, while retaining its soft texture. I hear that this particular dish is very popular and always runs out before noon. This means that getting a taste of the Emerald Special entails an early morning start. A non-negotiable part of every one of my Dim Sum meals is that there always has to be an order of Asado Siopao (P40). 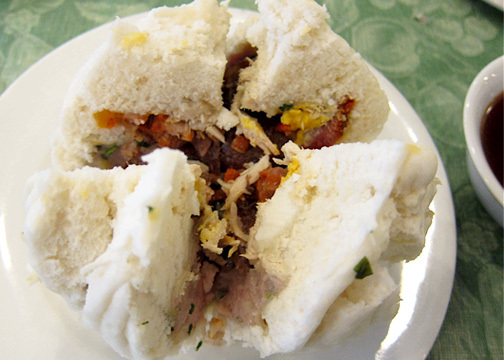 Also called Cha Siu Bau or Cha Shao Bau, this steamed bun filled with little pieces of honey-cured barbecued pork is my favorite type of Dim Sum. Emerald Garden’s version had just the right amount of sweetness and the meat filling was moist and had a nice fat to leanness ratio. Our server recommended that we try the Chicken Pie (P30). I am glad that we listened to her, as it was flaky, and crunchy with a curried chicken filling that had a slightly spicy flavor. To continue on with the crunch theme, we also asked for an order of Fried Dumplings (P130). The dumplings had minced pork filling and was served with a spicy soy sauce containing chopped herbs for that added kick. We next had a couple of steamed pork delights. First off, some Pork Siomai (P55), steamed wanton wrappers filled with minced pork and topped with a tiny carrot cube for effect, was served. The Siomai or Siu Mai as it is known elsewhere, was tender and had clean tasting flavors. The Pork Rice Roll (P90), had slices of barbecued pork encased in a delicate flour sheet topped with a sweetish soy-based sauce. A bite of this transported me back to a Wanchai roadside stall that I used to frequent after a night of partying. 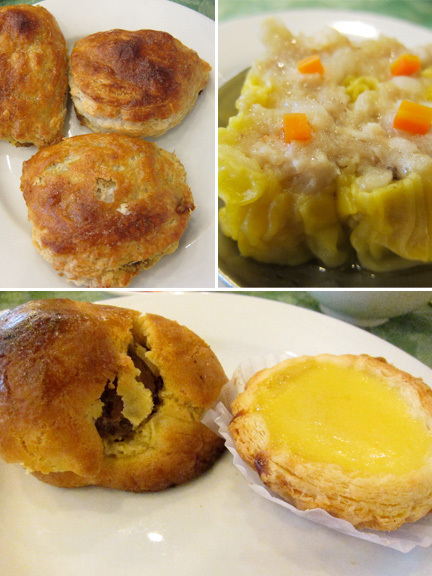 For our Dim Sum dessert course, we decided to try the Egg Tart (P30) and the Lotus Pie (P30). The egg tart had a crumbly puff pastry that sheltered an egg custard with just the right amount of sweetness. Egg tart lovers who are always looking out for new discoveries should give Emerald Garden’s version a try. I absolutely enjoyed having the Lotus Pie. From its bread-like crust to its yummy yellow bean filling, it reminded me of a scaled-down moon cake. I would have gone for a second piece but, tragically, I was full to the brim. This article was published in Olive Magazine Philippines issue #7. OMG! pork rice roll! Must. Go. Now. Sanju, agree with everything you said. And I'm also glad Emerald GArden is still serving their well-loved breakfast menu! Cheers! Ciao! Babyruth, Thank you! Please keep stopping by. Angeli, Will take you when you come. Thanks for the support as always!